Citation: Shortt N, “Perception, Cognition, Action: Applying Human Factors to Medical Device Design”. ONdrugDelivery Magazine, Issue 91 (Oct 2018), pp 12-14. As with most facets of the medical device design process, human factors (HF) usability engineering starts with outlining the prospective risks associated with the device. When designing a prefilled syringe (PFS) or autoinjector (AI), they are likely going to be used by lay-users and therefore usability engineering will be a necessary part of the submission to regulators. There is a model – perhaps better described as a frame of mind – that will help any member of the design team to put themselves in the user’s shoes from a HF perspective. This is PCA – Perception, Cognition, Action. But first, a little insight into the usability engineering risk process. What are the intended use environments? Are there any known use problems for this type of device? All of this information helps to envision the scene when populating the URRA, meaning the risks considered come from a rational, justified place. The URRA should be a living document that originates in the early stages of device development. This way the URRA can be utilised to inform designers of user interface design inputs that may reduce use-associated risk as far as reasonably possible, early in the process. This proactive approach means that, when it comes to validating the usability of the user interface, there are less likely to be inadequate risk mitigation. Inadequate risk mitigation by design usually leads to data that strongly suggests the need for better mitigation by design, which is more costly at the late design development stages than the early stages. A URRA outlines potential use errors associated with using a device, but it is also necessary to explain the possible causes of each use error. These causes are used to outline and justify suggested risk mitigations. However, what is often seen is that the stated causes are either unrealistic (e.g. Use error: user holds syringe upside down. Cause: user is blind – it seems unlikely that they would ever be prescribed a self-injected medication in the first place) or under analysed (e.g. Use error: user does not remove cap. Cause: user does not read the instructions – too much assumption that problems can only arise from not reading the instructions). A probable cause of this is that the mentality of the author(s) is not coming from a place of empathy for the user and the situation they are in when using the device. One of the strongest methods of understanding the causes of use errors is the Perception, Cognition, Action (PCA) model, which serves as a lesson in empathy for the plight of the user. It sheds light on things that seem obvious in hindsight but, at the design stage you only realise they have been missed when PCA is applied. For example, you have not included some form of alert to let users know the device is on. PCA could be argued to be the gold standard of URRA design, because it enables medical device developers (engineers, designers, researchers and HF specialists) to consider justified, rational use errors and know more easily where to stop. This is a proactive use of the PCA model. Perception is the first stage in the process of human interaction with a user interface. In Figure 1, there are two potential causes of a hazardous situation. 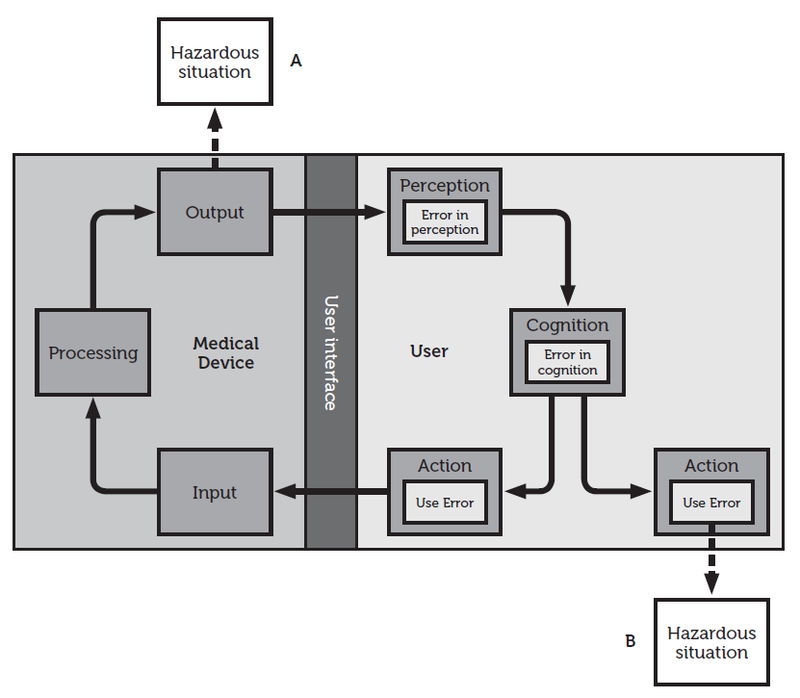 “Hazardous situation A – caused by a response of the medical device” and “Hazardous situation B – caused by user action or lack of action”.2 Perception is considered a contributing factor to, or a cause of, a use error, but a use error does not happen during perception of the user interface. Figure 1: How a hazardous situation may arise from either the user or the medical device as depicted in ANSI/AAMI/IEC 62366-1:2015. An example would be for a participant to listen out for the second click that tells them their dose has been successfully administered, but the ambient noise is too great, such that they don’t hear the click. The cause of error is that the user didn’t hear the click, so the solution would be to increase the volume of the click to allow for the regular noise level in a home environment. Thinking proactively when considering the intended users and use environments, if the intended users have reduced physical capabilities then there is likely to be greater risk that tasks cannot be completed as intended. If it is intended or most likely that the PFS or AI is used for self-administration at a user’s home, then audible cues must meet ambient sound levels that are common in a home environment. Similarly, if there are visual cues they must be visible at a light level that is common in a home environment. Once someone has perceived an output from the device interface, they need to consider what that output means. This is the second stage in the process of human interaction (Figure 1). Like perception, cognition is considered a contributing factor or a cause but not a juncture where the use error occurs. The distinction between perception and cognition can be blurred on occasion, but as long as the same rule is always applied when determining the root cause of a use error, it should be acceptable. In an instance where a participant sees the graphic indicating “20 seconds” on the instruction material for a PFS and assumes it to mean “wait 20 seconds after you have administered the dose” but it actually means “depressing the plunger should take around 20 seconds” this would be classed as a cognitive use error. They saw the information, but they understood it incorrectly and the action that manifested was counter to the intended use of the product. In this instance it may be because the condition this hypothetical PFS is being used for is commonly treated with a medication delivered by an AI, therefore most potential users are used to using a product where you do need to wait for 20 seconds after actuating the device. A mitigation would be to draw more attention to the information or to present the information more explicitly in order to attempt to highlight to users that the correct procedure is different to what they are currently used to. An example of a use error caused by action follows: a PFS is intended for subcutaneous administration by a patient in their own home. The task analysis outlines that, to administer the dose, the user must depress the plunger. A use error may be that they can’t depress the plunger. The cause? The plunger is too far away from the flange of the syringe, and the other hand is being used to pinch the skin. Action – the user physically cannot complete the task, despite knowing what they need to do. The recommendation? 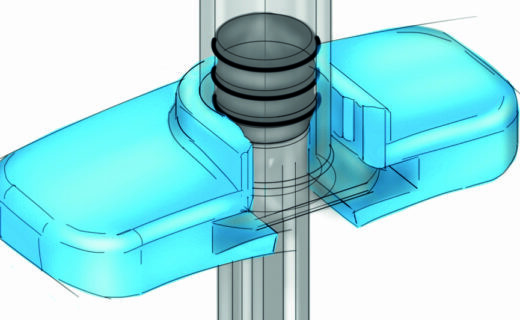 Ensure that the plunger is no farther away from the flange than the 5th percentile of capability for intended users. In a home environment, it is a real possibility that a user may not have any friends or family who can help them, and they may have to miss a dose until someone has time to help them. It may be days or weeks, and efficacy of treatment may be reduced. When conducting formative or validation studies, the PCA model can be used in a post-test interview to understand use errors that have occurred in the main body of the test session. A thorough post-test interview with a patient can unveil the root cause, which can be categorised as a difficulty with the perception, cognition or action of interacting with the user interface. When conducting test sessions, use errors must be analysed in a post-test interview. It is our experience that the root causes outlined in some reports can be too superficial – meaning the cause outlined for a use error can’t be used to inform design inputs. If root causes of use errors can be categorised into perception, cognition or action then the moderator can judge at that point that the use error has been investigated enough. The PCA model can then be used to write effective reports, it is a useful method for improving the readability of the causes of use errors. A readable results section will make it easier for the document author to then analyse the results and provide objective design outputs to contribute to design inputs for the next phase of design. PFS and AI design usually requires some HF input because, increasingly, these devices are designed for the lay-user. Using the PCA model even gets easier with practice, and can help non-HF specialists become champions for their team within their companies. “ISO 14971:2007, Medical devices – Application of risk management to medical devices”. International Organization for Standardization, 2007. “IEC 62366-1:2015, Medical devices – Part 1: Application of usability engineering to medical devices”. International Electrotechnical Commission, 2015.